Hot off the heels of his web server for the TI MSP430, [Rob] shared a MIDI booster pack for the MSP430 LaunchPad, an exceedingly inexpensive and ever more capable microcontroller that is getting somewhat of a cult following. [Rob]’s MIDI booster pack contains a MIDI in and out port as well as just about whatever MIDI manipulation apps his mind can dream up. So far, [Rob] has a MIDI arpeggiator, a harmonizer, an echo, filter, s MIDI monitor that displays incoming messages on a Nokia LCD, and a controller that interfaces with a light sensor or joystick to manipulate MIDI variables. Back in the 80s (and 90s, and even into the aughts), a dedicated MIDI arp or harmonizer was a crazy expensive piece of kit, especially considering how simple the device is. Those dedicated rackmount boxes can now be replaced with a TI LaunchPad and [Rob]’s booster pack. You can check out the arp and harmonizer in action after the break. 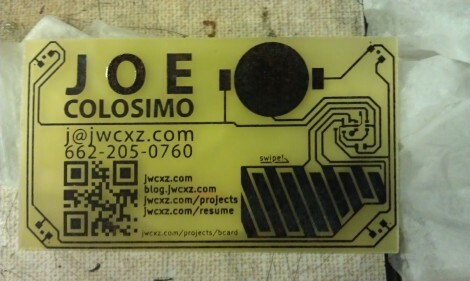 [Joe Colosimo] is putting on a show with his PCB business card project. The idea isn’t new, but his goal is to keep it simple and undercut the cost of all other PCB cards he’s seen. This is the third generation of the board design, and he’s just waiting on some solder mask solution before he tries running it through the reflow oven. The first two prototypes used some through-hole parts. Notably, the battery was to be positioned in a circular cut-out and held in place by a metal strap and some bare wires. But he couldn’t quite get it to work right so this design will transition to a surface-mount strap for one side, and the large circular pad for the other. At each corner of the board there is a footprint for an LED. He tried milling holes in the board to edge-light the substrate. Now he just mounts the LED upside down to give the board a blue glow. The LEDs are driven by an ATtiny10 microcontroller which takes input from the touch sensor array at the bottom right. He etched a QR code on the board which seems to work better than the milled QR experiments we saw back in April. The link at the top point’s to [Joe’s] main page on the card. Don’t forget to follow the links at the bottom which cover each part of the development more in-depth. 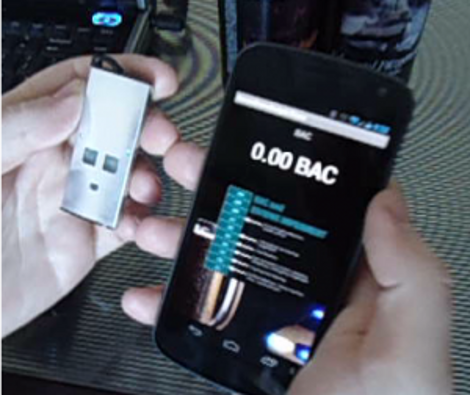 Sensordrone is a sensor-filled wireless dongle for use with a smart phone or other computer-like device. But perhaps this is better explained as the thing that makes your smart phone work exactly as the original Star Trek tricorders did. In one had you have the main unit that displays data, in the other you hold the sensor array which you can wave in front of things to take a reading. This is really just a Bluetooth module, battery, a handful of sensors, and a breakout header all packaged in a nice case. But seeing it used in the video after the break does make us a little giddy. 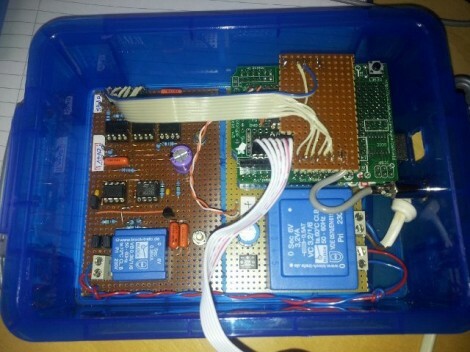 That breakout header gives you the option of connecting the Sensordrone to RS-232 or I2C devices. The first demonstration is a thermal printer being sent a print job from an Android phone. But the dongle isn’t just a pass-through. It comes with a range of sensors (those three windows in the case) for gas sensing, temperature, humidity, pressure, color sensing, and perhaps a few others. [Zach] sent in a project he’s been working on that brings hardware random number generators to common hardware you might have lying around. It’s called Whirlyfly and it turns an FPGA dev board into a hardware random number capable of outputting random bits over a USB connection at 3 Mbps. Previously, the whirlygig ran on a custom CPLD that interfaced to a *nix box and provided high quality random numbers via /dev/hw_random. [Zach]’s efforts takes the core of the whirlygig and ports it to the very popular and inexpensive Papilio One FPGA dev board. As for what [Zach] can do with his random number generator, it’s extremely easy to write a Monte Carlo experiment to approximate the value of π with a better accuracy than [Ptolemy] was able to muster 1900 years ago. There’s also the aspect of encryption, and – why you would do this we have no idea – making an uncompressable file is also possible. A team of rocketry enthusiasts at Boston University have been working on a small hybrid rocket motor that serves as a test bed for a larger, yet-to-be-designed power plant that will hopefully launch a rocket into space. The static tests of the BURT Mk. II began last April with a series of tests using HTPB solid fuel and Nitrous Oxide as the oxidizer. The team had a series of failures – mostly due to the JB Weld seal on the igniter leads blowing out – but managed a 10 second burn on April 21st. For later tests, a vector drive system built by a complimentary Boston University engineering group was used to control the direction of the thrust up to 12 degrees away from the axis of the engine. That’s an impressive bit of kit, especially considering the exhaust from the rocket reaches over 5000 degrees Fahrenheit. Even though it’s summer now and the Boston University team is on a much deserved break, we can’t wait to see what the BURT team comes up with next year. Hopefully we’ll see a flight test that reaches the team’s goal of the Karman line. We knew this wouldn’t take long. [David] sent a high altitude balloon into the upper atmosphere last weekend using a Raspberry Pi as the brains of the payload. [David]’s payload consisted of a Raspberry Pi, natch, with a Logitech webcam, GPS receiver, and six AA batteries wired into a LDO regulator with a monstrous heat sink to keep everything in the EPX foam enclosure relatively warm in the frigid rarefied air of near space. A high altitude balloon isn’t much fun without some real-time data coming down from the upper atmosphere, so [David] used a Radiometrix NTX2 transmitter module (anyone know of an equivalent part for the USA?) that transmits a measly 10 milliwatts. Even though the transmitter has an ‘official’ range of 500 meters, [David] got word of image data being received in Northern Ireland, over 500 km away. We’re pretty impressed with [David]’s flight – and the fact that his flight is now 12th place on the list of UK balloon altitude records – but now we’re wondering what could be done with another Raspi flight to near space. [David] had a lot of computing horsepower up there, enough to get images from a webcam and send them down to earth. Now we’re wondering what else could be done with a Raspberry Pi in space. You can check out the GoPro video of the very fast decent after the break, or check out the received images on [David]’s Flickr.